Skies the color of lapis lazuli, the sea the color of tourmaline, the soft sandy beaches the color of ivory, and the golf courses the color of emeralds, Cancun is indeed a precious location. Long associated as being “the” destination for college students on Spring Break, as well as divers yearning to dive its prolific sea, Cancun has now evolved into a luxury destination. Cancun, Mexico located in the Yucatan Peninsula in the state of Quintana Roo, is rich in natural beauty, culture, diverse gastronomy, world-class luxury resorts and spas, and now also has luxury shopping. Cancun, just a short flight from major US gateway cities, is 1.5 hours from Miami, 2 hours from Dallas, 4 hours from New York and Chicago and 6 hours from Los Angeles. With a population of 350,000, it is more then a sleepy little resort, but a far cry from being a major metropolis. 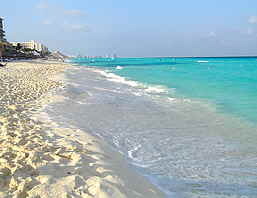 On May 4, 2005, Edward F. Nesta and I, longing for sunny, warm weather, since spring had yet to arrive in New York, flew to Cancun to enjoy 3 nights at Le Meridien Cancun Resort & Spa. Mr. Israel Urbino and Mr. Roger Sauri of the Cancun Convention & Visitors Bureau met us at the Cancun International Airport where we were immediately rewarded with bright blue skies and warm weather, as we drove the 10 km (6 miles) from the airport to our hotel, located in the Hotel Zone. After a gracious check-in by Mr. Al Behar, a warm welcome from Ms. Marcela Guisa from the PR department, and a refreshing welcome juice in the lobby, our Bellman Marco whisked us to our spacious ocean-view room with its own balcony. 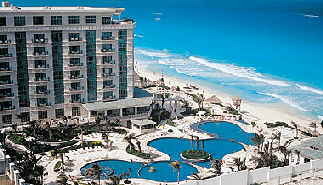 The hotel is located directly on the beach, so sun worshippers can soak up the rays as well as the views. Read our article on Le Meridien Cancun Resort & Spa in our Hotels & Resorts section. Since Edward’s luggage did not arrive at the airport when we did, we needed to go out shopping to purchase a few items for him – like a bathing suit! We went to the new outdoor shopping center, La Isla Shopping Village, Boulevard Kulkulcàn Km 12.5, in the Hotel Zone, which was a 5-minute taxi ride from our hotel. This upscale shopping center has small boutique shops, restaurants and even a boat cruise where you can ride around the narrow canals of the shopping center. After we found him a new surfer bathing suit, we went to purchase several bottles of vanilla to take home with us, as Mexico is famous for its vanilla. We returned to the hotel laden with packages and had a short time to relax before our dinner reservation at Aïoli Restaurant at Le Meridien Cancun Resort & Spa. 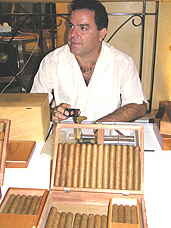 We went to the lobby, where they had many interesting Cuban cigars for sale, and enjoyed speaking with Jorge who told us about the many types of cigars available. Our next stop was Le Rendez-Vous Bar and Lounge, where there was live jazz music and special mango cocktails. 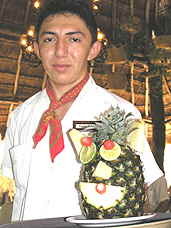 Each month the hotel features a special theme, and May was mango month. We met Ms. Marcela Guisa for pre-dinner mango cocktails, Mango Slammers made with Amaretto, Southern Comfort, Whiskey, mango and lime juice and Ballenas made with Rum, Vodka, peach and mango juice, before we went to dinner. Aïoli Restaurant serves Mediterranean cuisine with a French influence. Read about our dinner at Aïoli Restaurant in the Restaurants section. After dinner, we took a moonlit stroll through the hotel grounds before we went to sleep. The next morning, after a lavish buffet breakfast at the hotel, Roger Sauri drove us to visit Tulum, located 130 km south of Cancun, and although not as large as some of the other important Mayan ruins in the Yucatan Peninsula, which consists of the Mexican states of Yucatan, Campeche, and Quintana Roo, as well as the country of Belize and part of Guatemala, Tulum is an impressive Mayan archeological site, built around 900 A.D. Tulum was the last built site. The name, Tulum, was the name of the king, and means “tomorrow” or “morning.” As we drove to Tulum, Mr. Sauri, who is a Mayan descendant, told us about the Mayan culture and its language. There are 12 different Mayan dialects. 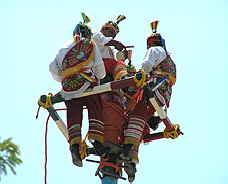 After we arrived at Tulum, we stopped to watch the “flying birdmen” in colorful costumes sitting on top of a pole, where they played music, and then “flew” upside down. Afterwards, we took the “train” to the archeological site. Although we had visited other archeological sites both in and outside Mexico City and on Cozumel and Belize, Tulum, was immensely impressive with its many buildings and the Caribbean Sea as its backdrop. There is something almost mystical about these special places, and Tulum should be on your “must do list” when you visit Cancun. 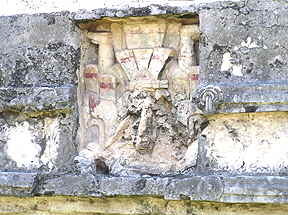 Some of the more interesting structures at the site include El Castillo (the Castle), Templo de los Frescoes (Temple of the Frescoes) and the Templo del Dios Descendente (Temple of the Descending God). At the Temple of the Frescoes you will be able to see some of the restored frescoes, and at the Temple of the Descending God you will be able to see a carving of a figure in the downward position. Some interesting points to note is that symbolism is very important, and the four buildings in the four points represent the four seasons. The entrances to the buildings are very low, which required the people to “bow” to honor the Gods in order to enter. From the Castle there are magnificent views of the Caribbean Sea. While we were there, a few of the visitors stopped to take a dip in the sea, which we would have done as well, if we had more time. Tulum is open everyday from 8:00 am – 5:00 pm, and there are gift and snack shops there. After we left Tulum, we stopped briefly to see the statue in Akumal, which depicts the Spaniard who was shipwrecked in 1511 and married a Mayan Princess. Their children became the first mestizos. Our next adventure was to Xcaret, an eco-archeological park located 72 km south of the Cancun International Airport. 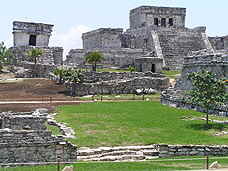 The name Xcaret in Mayan means “little inlet”, and was an important port and ceremonial center. The park is open year-round from 8:30 am – 9:00 pm in winter and from 8:30 am – 10 pm in summer. Arrive early, because there is much to see and do at the park. We were told not to wear suntan lotion, as Xcaret is eco-friendly, and were given biodegradable suntan lotion when we entered the park. Xcaret offers something for everyone as we discovered that there were archeological sites, a Coral Reef Aquarium, Manatee Lagoon, the largest Butterfly Pavilion in the world with 4,000 butterflies born each month, Bat Cave, Wild Bird Breeding Apiary with over 37 different species, Sea turtle conservation programs, Botanical Garden with over 118,000 plants, a replica of a Mayan Village, Mushroom Farm, Jaguar and Puma Islands, Crocodile exhibition of crocodiles born in captivity at Xcaret, Tropical Jungle Walk, Museum and Theatre presentations, Equestrian Show, Orchid Conservatory, Underground and Mayan Village River where you can ride the river current, swim with dolphins, snorkel, scuba and snuba, as well as horseback riding tours, and in the evening, there is Xcaret Noche Espectacular at El Gran Tlachco, which is a spectacular dinner show. Combined with seven restaurants to choose from, we hardly knew what to do first, so decided to have lunch at La Laguna International Buffet and map out what we wanted to do. It was a very warm day and Pedro Pablo our waiter convinced us that we should try a Pi-Eye, a refreshing combination of four juices that could be served with or without alcohol. We decided on without, and enjoyed traditional Yucatan cuisine of lime soup, corn soup, tortillas, empanadas, chicken, shrimp and skirt steak, while Mariachis entertained the restaurant guests. After lunch, Roger told us that the river swim was a “must” so we changed into our bathing suits, left our clothes in a rented locker, and walked to the river entrance where we left our sandals in a waterproof bag that we would pick up when we finished our swim, and received a life preserver. We entered the river and floated serenely along on the river current through the underground caves. There are two routes to choose from, the underground and the above ground, but we wanted to see the caves. The river swim took 30 minutes and provided a nice cool respite from the extremely warm temperatures. Afterwards, we toured the park to see the Coral Reef Aquarium, Manatees, Turtles, Crocodiles, Jaguars, Mayan Village, Catholic Church and the replica of a Cemetery, before a heavy downpour had us running for cover in the locker room. By the time we changed clothes, the rain had stopped, and we stopped by the Mayan Ball Court, which is still used on Sundays, then walked through the Mayan Village to El Gran Tlachco for dinner and a show, which combined culture, music, folklore and pageantry with over 300 performers. We dined by candlelight, and thrilled at the sites and sounds of this spectacular show. We returned to the hotel tired but content after a very fulfilling day. We awoke early the next morning, and after another delicious buffet on the veranda of the hotel with views of the sea, we went to indulge in spa treatments at Spa del Mar at the hotel. This beautiful 15,000 sq. foot world-class European spa features Elemis products, and has 14 treatment rooms. 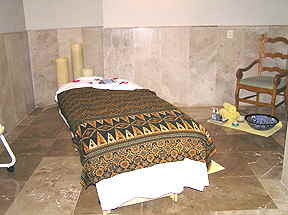 Read about Spa del Mar in our Spas section. After a relaxing massage at Spa del Mar, we walked along the beach and watched parasailing, jet skiers and water-skiers, before we left to spend the afternoon scuba diving, since a trip to Cancun would not be complete for us without getting in some dives. Read about scuba diving in Cancun in our Events section. After making 2 dives exploring the undersea world of Cancun, we returned to the hotel famished and had lunch and our first Margaritas since we arrived in Cancun, at the outside poolside restaurant, St. Trop. Although the hotel had 3 inviting negative-edge pools, each with a different temperature, and a Jacuzzi in one of the pools, we opted to take another beachside stroll where the warm, soft sand left tiny crystals on our feet, and we played in the waves that lapped at the beach. A short nap, and we were ready to attend the red carpet grand opening cocktail party at Luxury Avenue at Kukulcan Plaza, a luxury shopping experience where world-famous designer names in jewelry, gifts, perfumes and cosmetics can be found. It was a night to remember, as the guests arrived on the red carpet and were surrounded with the flashing lights of the paparazzi. 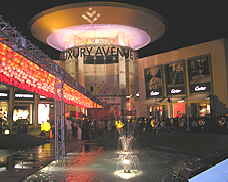 Read about the Luxury Avenue at Kukulcan Plaza party in our Travel News section. After a late night partying with the stars, we returned to our hotel to pack as we had a flight at 3:00 pm back to New York. You may also enjoy our other articles on Cancun in the Hotels & Resorts, Restaurants, Spas, Chefs' Recipes, Liquor Cabinet, Events and Travel News sections. 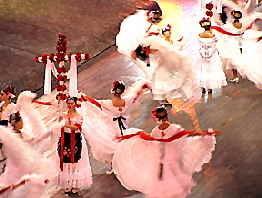 For additional information on Cancun, please visit the Cancun Convention & Visitors Bureau. © July 2005. Luxury Experience. www.luxuryexperience.com. All rights reserved.